Home BlogKnowledge Do Batteries Emit Radiation? So many of the electronics we use every day like our cell phone, laptop, tablets, and more emit dangerous EMF radiation. However, many people wonder if this radiation is being emitted from the batteries of these devices, or from other components. In this quick guide we’ll cover all that you need to know about how batteries work, whether they emit any kind of radiation, and if they do, how can you protect yourself. First of all, to answer the immediate question, do batteries emit radiation: The answer would be no. 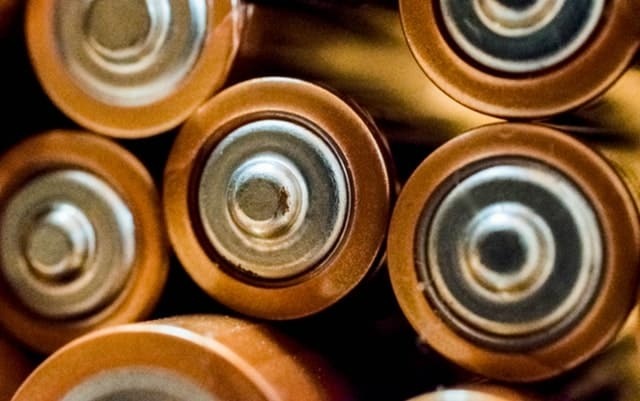 Typical batteries, like AA, AAA, and more, use chemistry to produce electricity. Chemical reactions occur on the electrode of the battery, which is converted to electricity and powers the device. This simple reaction does not produce any form or radiation, including EMF radiation. This means that if you take a typical EMF meter, like the Trifield TF2 for example, it will not read any magnetic, electric, or RF radiation from the batteries themselves. Now, there is more to this, because the batteries provide power to devices that will then produce small, or large amounts of EMF radiation, which we’ll talk about down below. So although batteries to not directly produce radiation, they can certainly be the cause of it. Let’s talk about a few of the most popular types of batteries, how they work, and whether they emit any form of radiation. Do Alkaline Batteries Emit Radiation? This answer is similar to the one I talked about above. Alkaline batteries, which would be your AA, AAA, etc. do not emit any radiation when they are just sitting on your counter, because there is nothing to produce the chemical reaction that would produce energy. To better understand this, let’s talk briefly about how alkaline batteries work. It’s important to remember when we think about whether a battery emits radiation, that its really just a tube of chemicals. Picture putting a couple of AA batteries into a flashlight. What you’re really doing is completing a circuit for the device. That is why the + and – of the battery are always aligned the same way, and pressed against metal conductors on each end. The batteries store chemical energy inside of them, and when the circuit is completed, this chemical energy turns into electrical energy that flows out of the battery and lights the bulb of the flashlight. I won’t go into the specific chemistry that allows this to occur, but you can google that to learn more. The important point is to remember that with alkaline batteries, they are just holders of chemical kinetic energy, and only produce electricity when an electrical circuit is made. Whether they are currently providing electricity to a device, or sitting on your table, they do not emit EMF radiation on their own. However, if they are powering say, a cordless phone, which does emit radiation, then they are allowing that to occur. This is an important distinction to remember. Do Lithium-Ion Batteries Emit Radiation? No, similar to alkaline batteries, lithium ion batteries are simply storage of chemical energy, that without a completed circuit does not provide electricity, and does not emit any radiation. This is a common misconception though, because the vast majority of devices that contain lithium ion batteries do emit harmful EMF radiation. Think cell phones, tablets, laptops, etc. Lithium-ion batteries are the choice for these devices because they are compact, hold a good charge, and are rechargeable. Lithium-ion batteries get a bad wrap because they power EMF emitting devices like cell phones. However, it’s important to remember that when a cell phone is off, it emits virtually no EMF radiation. The same as when it is in airplane mode or not in use. So although the battery provides the power that ultimately results in radiation emissions, the battery itself is not the culprit. To better understand this, lets briefly touch on how lithium-ion batteries actually work. Just like with an alkaline battery, a rechargeable lithium-ion battery is comprised of one or more compartments called cells. A chemical called an electrolyte. The positive electrode is commonly made out of a chemical compound called lithium-cobalt oxide or lithium iron phosphate. The negative electrode is usually made from carbon, and the electrolyte chemical can be one of a variety of different chemicals and compounds. When the lithium-ion battery is charging, the positive electrode gives up some of its ions, which travel through the electrolyte to the negative electrode. This builds up kinetic chemical energy. When the battery is in use, the process happens in reverse, which provides power to the device. One unique part of lithium-ion batteries is that they usually have tiny electronic controllers contained in the pack. These controllers help to regulate the charge and discharge of the battery and prevent it from overcharging. Ultimately, batteries do not themselves emit EMF radiation, and are not something that should be of concern to most consumers. You should focus your concern and safety education on the devices these batteries are powering. Cell phones are likely the largest risk and most common exposure source of EMF radiation. I’d encourage you to check out my other posts in the knowledge section of this site to learn more. Just remember that the best things you can do are to reduce your exposure, increase your distance, and get proper products that help to protect you from excessive exposure to EMF radiation.